Action at the Nest of Champions between Akwa United and Enyimba failed to produce more than one goal as Enyimba lost to the Promise Keepers for the first time in the Nigeria Professional Football League (NPFL). Musa Newman gave his side the only goal of his encounter, making it four goals in 4 games for the former MFM FC man. Captain Mfon Udoh was sidelined for the cracker leading to Gbenga Ogunbote’s lads to leaving Uyo empty handed. 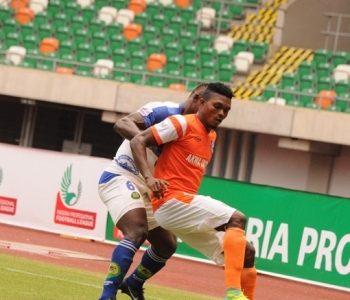 The win takes Akwa United to 3rd on the log with 43 points while Enyimba maintains 7th place. 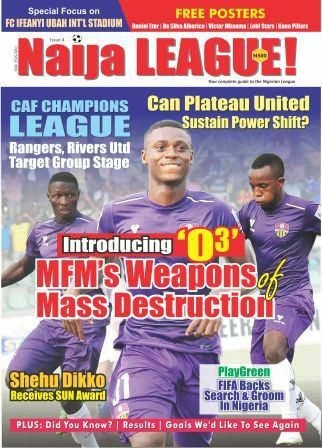 MFM FC keeps pace behind table toppers; Plateau United as the Fidelis Ilekwuchu led side defeated ABS FC by 2-1. The NPFL top goal scorer failed to find the net through out the day, but his contributions made sure his side still have their eyes on the title. El-Kanemi Warriors recovered from their last home draw with Rangers by leveraging on a late goal (90+5) to grab maximum points against Plateau United. The goal came in courtesy of Sunday Anthony. Kennedy Boboye’s lads still lead the pack with 48 points while El-Kanemi got back to 4th position on 43 points, same with Akwa United, but behind due to goal difference. Lobi Stars of Makurdi had the biggest win of the day after trouncing Rangers 3-1. Goals from Ezekeil Mbah, Kingsley Eduwo and Anthony Okpotu made it safe for the Makurdi landlords, while Daniel Etor got the consolatory strike for the visitors. In Lafia, visiting Gombe United held Nasarawa United to a 1-1 draw. The homers went in front through a 21st minute goal by Benin international, Anthonin Oussou, but his strike was cancelled out in the second period by Sani Abbani and the game ended in a deadlock. Sunshine defeated Abia Warriors 1-0 through Abiodun Joseph's strike. The Umahia based side went on their second successive games on the road and the loss means they couldn't get any point from a possible 6. Relegation strugglers, Shooting Stars Sports Club got past Wikki Tourists by 2 goals to nil, while Peter Momoh of Niger Tornadoes’ strike was enough to see off their guests, Remo Stars FC. Katsina United had a bad day in office as their trip to Nnewi proved futile. The Anamabra Warriors got their first win in four games as club top scorer, Godwin Obaje and Chijioke Alaekwe scored in each half to hand the home side maximum points. Obaje opened the score line in the first half by converting from the spot after Chijioke was adjudged to have been brought down inside the box. Alaekwe, who only starting his first game of the season was a thorn in the flesh of the Katsina United defense and his work bared fruit in the late minutes when he connected Bright Onyedikachi’s cross to open his season’s goal account with a superb header. The game, which started with the presentation of the League Bloggers Award to coach Yaw Preko as the best manager in May, paid off as his lads stared another month on a winning note.